Dome of Visions is inspired by the ideas conceived in the 1940s by the American futurist and architect Buckminster Fuller. He is the father of geodestic domes. In the 1960s he described a 3 km geodesic dome spanning Midtown Manhattan that would regulate weather and reduce air pollution. 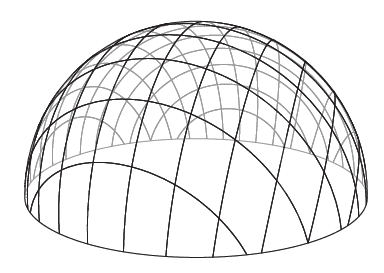 The dome principle builds on studies of, among other things, minimalist structures whose surface tension creates the basis for the supporting framework and facade. The Dome of Visions architect is Kristoffer Tejlgaard (M. Arch). Kristoffer has been architect and builder of geodetic buildings for several years. His aim is to make architecture a freer art form. Profit and regulation need not overshadow a more harmonic relationship between people and nature. His work is aimed at making us realize that different systems inherently affect one another. We can share that knowledge – and, together, we can achieve more with less. Dome 1.0 was constructed by NCC in close cooperation with architects Kristoffer Tejlgaard and Benny Jepsen. It is 10,5 meters in height and has a diameter of 21 meters. 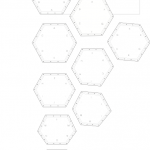 Building envelope: The nine pentagons and hexagons form the building envelope. This simple way of connecting the surfaces can only be done with flexible plastic. The surfaces overlap for increased strength along the edges and to let water run off, as with panes in traditional greenhouses. The node: Laser cut in sheet steel. Outer facade: The Dome consists of two overlapping geometries forming a 350 m2 room. 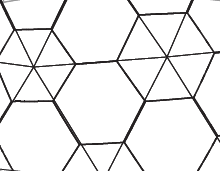 The outer layer, 850 m2 in surface area, consists of 256 transparent polycarbonate plates in a plate-stabilized, v.8 dodecahedron pattern. The inner layer consists of 250 90mm X 180mm Kerto® rods assembled in a v.4 icosahedron, lattice pattern with 91 steel nodes. 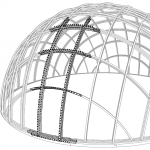 Dome 2.0 is constructed with a different core geometry than Dome 1.0. The height is 0,8 m lower and the width is 0,2 wider. 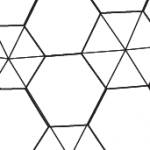 But the main difference is leaving the geodesic geometry in favour of a square grid. Dome 2.0 is constructed by NCC in close cooperation with architect Kristoffer Tejlgaard. 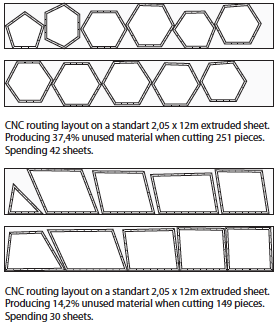 The square grid is based on the dimensions of the industrial standard sheet of extrudet plastics. 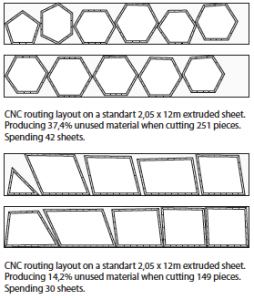 Enabling a better usage of the material cut for the facade. 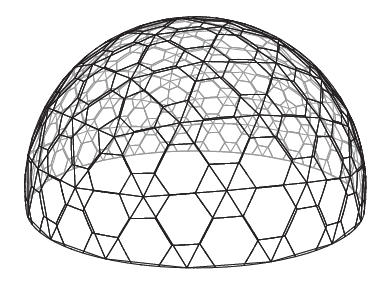 Using the new geometry the Dome 2.0 can span the same area as Dome 1.0 using 25-30% less facade material. Making better use of the material and achieving bigger sections, reduceses the amount of overlapping parts from 800m to 630m, decreasing the amount of bolts needed to join the facade from 5000 to 4000 pieces. And increases the transperancy and the light intake with an area of 13,5m2. The static skeleton and the facade follows the same geometry, in order to harvest as many advantages as possible. 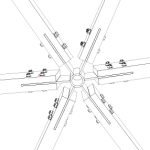 The joining of the facade takes place on bolts pre-installed in the skeleton to make erection faster. The overlap is concealed behind the structure, when looking from inside, increasing transparency.